The afternoon sessions included Titan and other satellites in the Solar System. 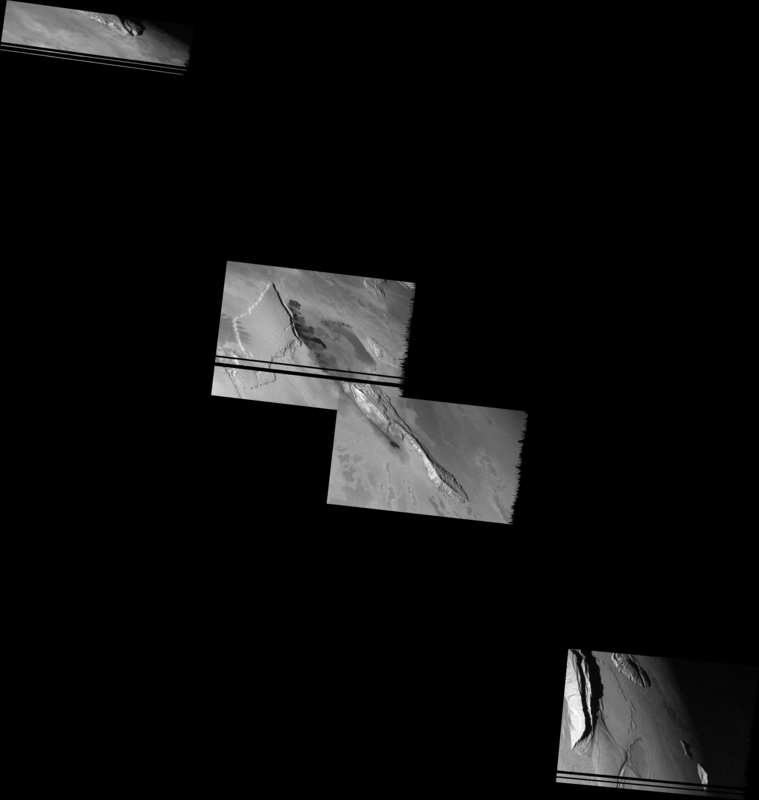 I gave a talk on Cassini images of Titan, particularly those of Titan's polar regions. Alfred McEwen, my advisor, gave a talk on the Io Volcano Observer (IVO, pronounced eye-voh), a mission concept in the Discovery & Scout Mission Capability Expansion (DSCME) program. I have reported on this concept study previously and on the abstract McEwen submitted to the conference. The talk provided a few new details on this mission concept. The IVO team is aiming for a 2013 launch on an Atlas V with a back-up launch date in 2014. The spacecraft would be launched into a Venus-Earth gravity assist trajectory with an arrival at Jupiter in the 2019 timeframe. Once at Jupiter, IVO would flyby Io shortly before Jupiter orbit insertion, which would lower JOI delta-V and provide an insurance flyby in case any issues occur during the JOI burn. Once at Jupiter, IVO would be injected into a 200-day orbit around Jupiter with a 45 degree inclination. Over the course of the 1-2 year mission, IVO would use 5-10 Io flybys to bring its orbital period down to 30 days. Each flyby would have a close-approach distance between 500 and 1000 km with 100 km flybys possible later in the mission. The high-inclination orbit would provide much needed polar coverage, which would be complementary to observations acquired by Galileo and the Europa orbiter mission. Flybys would occur at similar solar longitudes on Io to reduce the variables when comparing images between flybys. The base payload for IVO includes a narrow-angle camera, a Thermal Imager, a Neutral Mass Spectrometer, and a Radiation detector for a total payload weight of 34 kg (44 kg with 30% margin). The nominal narrow angle camera planned would weigh 15 kg and would have a resolution of 10 microradians per pixel (the same as Galileo SSI). The goal for this camera is to observe Io's ever-changing surface by observing the same volcanic features during each flyby. 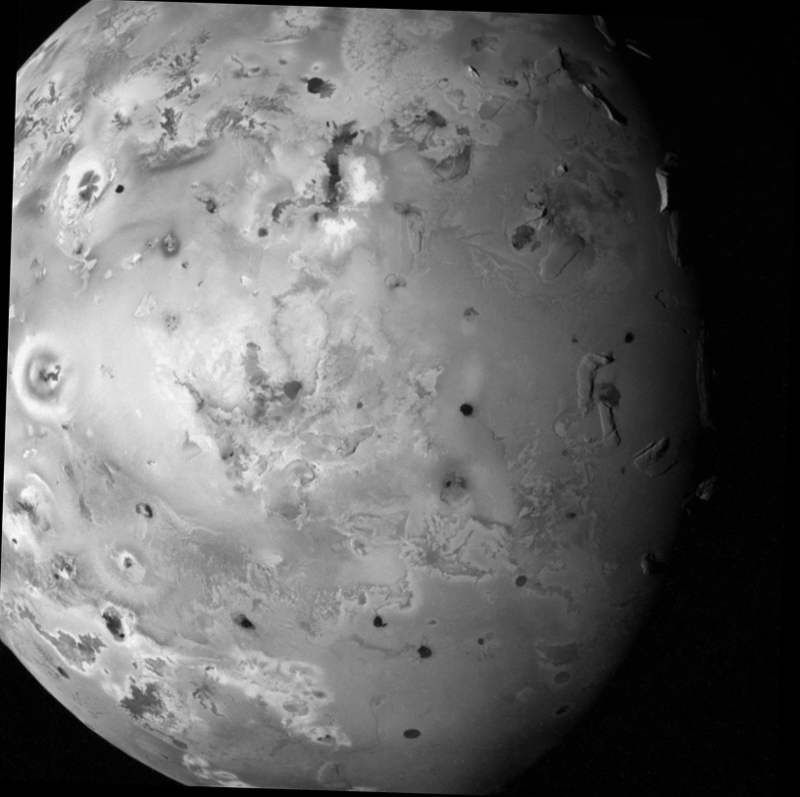 The camera would also be used to measure Io's limb topography, which would help constrain Io's tidal bulge and thus provide constraints on Io's current tidal heating. The camera will make use of active pixel sensors, which have increased radiation hardness compared to traditional CCDs. These sensors will also allow the IVO team to acquire simultaneous multi-spectral imaging. This would make acquiring color mosaics a much simpler task as well as help support lava temperature measurements, since lava fountains can change on the order of seconds. The Thermal Imager would be similar to the THEMIS instrument on the Mars Odyssey spacecraft. The IVO team is looking for an instrument that would acquire near- to mid-IR imaging at 3, 8, and 20 microns, to measure Io's heat flow. Assuming something akin to THEMIS is used (which is possible considering that the PI for THEMIS, Phil Christensen, is on the IVO team), the Thermal Imager would have a 4.6 deg. FOV with 250 microradians/pixel resolution (effectively 1 km/pixel per 4000 km). Unfortunately, Alfred was nearing his alloted time by the time he finished discussing the Thermal Imager so he didn't spend time covering NMS, UVS, and the Radiation Detector. He pointed out that the "Powerpoint" mission might have a chance in Hell of flying, considering that Io is a world of fire and brimstone, there is a team member named Dante, and that Alfred will be 66 years old when IVO arrives at Jupiter (assuming that IVO flies on the back-up 2014 VEEGA trajectory). Wanderspace has posted two new Io wallpapers for your computer's desktop. These graphics are based on mosaics I put together a few months ago. 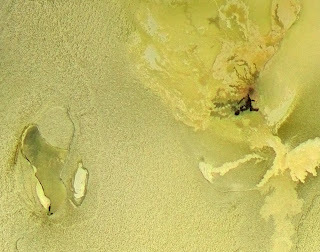 One graphic uses a mosaic from I27 and covers Sobo Fluctus, a volcano between Chaac and Camaxtli on Io's anti-Jovian hemisphere (seen on the right side of the graphic at left). The other uses a mosaic of Tvashtar Patera from I32 that was then colorized by UMSF reader Ricardo Nunes. 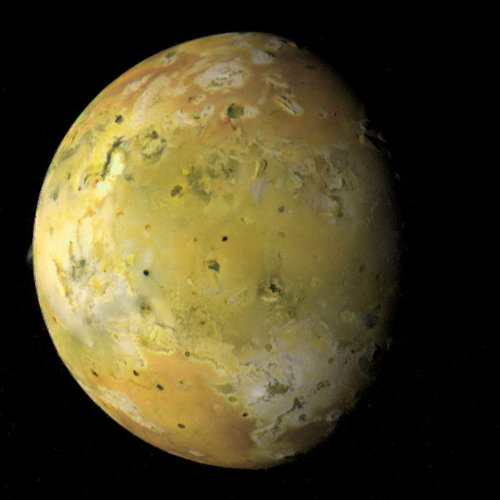 I haven't posted any links to images acquired by amateur astronomers lately, but trust me, Io is still there. Paul Haese acquired a couple of very nice views of Io transiting in front of Jupiter on May 10. The detail is good enough to easily make out the difference in brightness between the equatorial and polar regions. 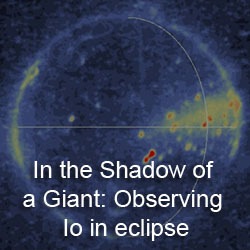 Christopher Go and Tomio Akutsu acquired several images of an Io transit on May 1. There is a new article in press in the journal Icarus titled, "Geologic Mapping of the Zal region of Io," by Melissa Bunte, David Williams, and Ron Greeley. A summary of their results was presented in March at the Lunar and Planetary Sciences Conference and was reported on here. Now the full paper is available on the Icarus website (subscription required to view paper). 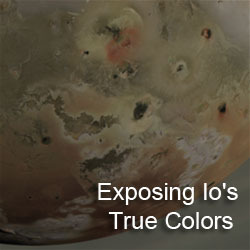 This paper is based on imagery acquired during the I25 and I27 Galileo encounters with Io. Like many of the regions mapped by the ASU previously, such as near Camaxtli Patera, Tohil Mons, Amirani, and Thor, the authors mapped 5 basic units in the region: mountains/plateaus, smooth/layered plains, patera floor material, flow material, and diffuse materials. The flow features in this area appear to be generated from a small patera lying near the western margin of South Zal Montes (they propose the name "Rustam Patera" for this volcano) or from a fissure that runs north from "Rustam" along the western margin of South Zal Montes and the eastern margin of North Zal Montes. 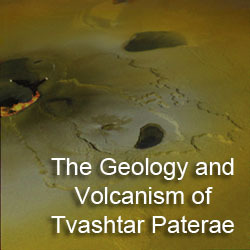 The flows include bright flows (possibly of sulfurous composition) radiating out from "Rustam" and dark flows which flow east across part of Zal Patera from the northern part of the fissure. Additional flow features are also seen within Zal Patera, but these appear to be older in age based on their brighter appearance. One interesting hypothesis made in this paper is that the various components of Zal Montes, which surround Zal Patera to the west, east, and south, were originally part of a single structure. This feature then broke-up due to strike-slip then extensional faulting, opening up Zal Patera. Similar plate tectonics-in-miniature is theorized for formation of Hi'iaka Patera. The paper goes on to describe the degradational processes that have occurred at the mountains in the region. One feature I wished the paper expounded on further is a small volcano west of North Zal Montes, which they suggest the name "At'am Patera" for. What makes the volcano interesting is that it appears to be one of a very rare breed of explosive Ionian volcano. 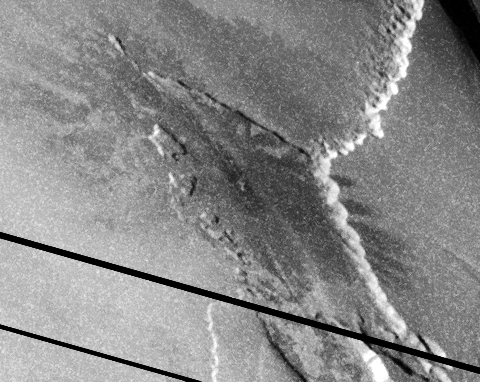 "At'am" erupted between late-June and mid-September 1997, producing a white, Sulfur dioxide-rich plume deposit and a dark-green pyroclastic deposit with a digitate margin. Some of both materials was deposited on North Zal Montes. The digitate appearance is due to the interaction between the pyroclastic flow and the arcuate margin of the western part of North Zal Montes. This morphology may provide clues on how these pyroclastic deposits are formed on Io. Oddly, for an Ionian eruption, no lava flows or thermal emission were observed at this volcano. Also, the central vent is among the smallest paterae found on Io. It is possible that the 1997 eruption could have been the result of an intrusive event, where magma ascends from a deeper chamber, but fails to reach the surface. However, volatiles and other materials, being more buoyant, do make it to the surface. 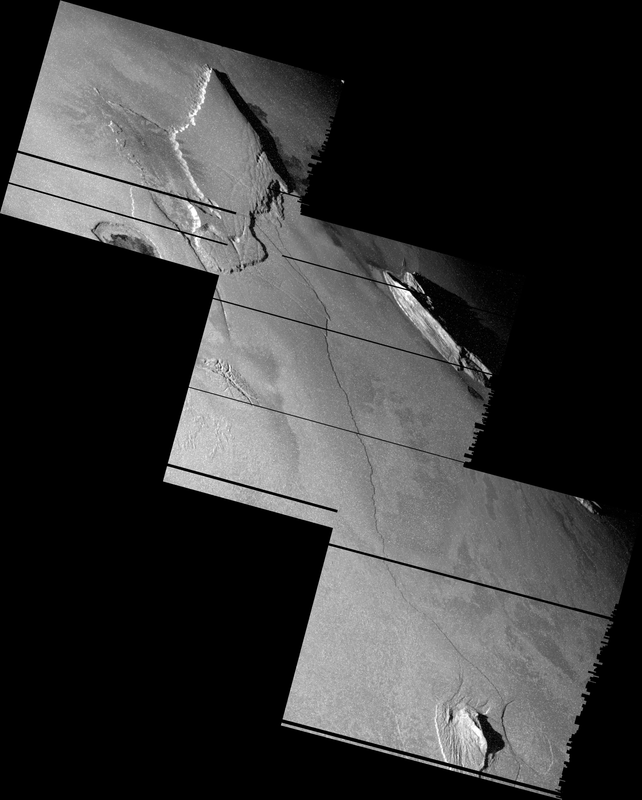 The paper does touch a bit on the plume seen at Zal last year by New Horizons. This plume is centered on Zal Patera (unlike the plume deposit seen by Galileo starting in Sept. 1997 which surrounds "At'am Patera"). Zal Patera is also the site of fresh surface changes, which include a new dark plume deposit and fresh dark lava flows. As mentioned last month, NASA has commissioned several concept studies for Discovery-class mission that make use of the new Advanced Stirling Radioisotope Generator (ASRG) power source, a more efficient RTG that makes use of plutonium for power. One of these concepts is the Io Volcano Observer (IVO), a mission to study Io's volcanic activity. The leader of the study, Alfred McEwen, submitted an abstract on the mission concept to the Lunar and Planetary Laboratory Conference (LPLC) to be held next week in Tucson. I will be there giving a talk on the state of Cassini Imaging, particularly imaging of Titan. The abstract makes public a few more details on the study. The IVO team envision a small spacecraft that orbits Jupiter in a highly inclined orbit, encountering Io at every periapse. The high-inclination orbit helps to reduce IVO's radiation exposure during periapse. Each orbit would last between 30 and 200 days, though shorter orbit would provide better distant monitoring. Due to the low-cost of the mission, the payload has to be kept simplistic. 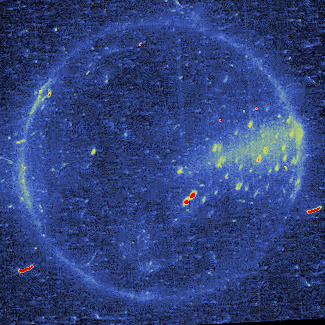 The team has currently include a baseline payload of a narrow-angle camera (with some color imaging capability), a thermal imager (capable of mapping Io's thermal emission at 3, 8, and 15 microns, and at some silicate absorption bands), a Neutral Mass Spectrometer, and a Radiation detector. Other potential instruments include a Wide-angle camera, an ultra-stable oscillator (used for gravity measurements), a near-infrared spectrometer (I guess a toss-up between this and the thermal mapper), an ultraviolet spectrometer, and a magnetometer. 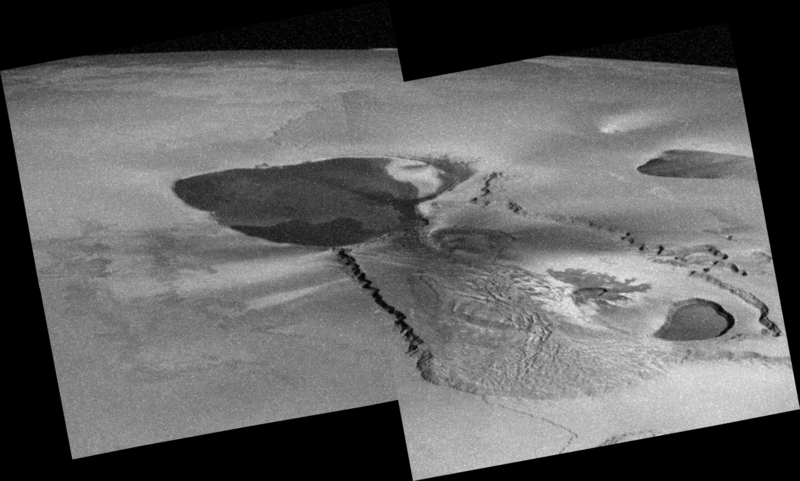 The team has also outlined the scientific goals for this mission which include understanding Io's volcanic processes, composition, heat flow, and environment. According to Io9.com, Europa is the awesomest moon in the Solar System. Of course that is wrong, it isn't. Not by a long shot. Io is just as colonize-able as Titan (pick your poison: radiation or carcinogenic sand dunes). Ganymede is more so than Europa (using amount of radiation as a metric). And why does Enceladus have one blip for "Potential to colonize" but Phobos and Deimos get four. Thanks to Juramike at UMSF.com for the heads up. Io has been hiding out from the astrophotographers over the last few weeks. Christopher Go captured a nice view of Jupiter with Io's shadow on May 1. "Asimov" posted some of his captures of Io and Jupiter from this morning on the South Celestial Pole forum. I still haven't read that Io footprint paper. As you can see, I still haven't gotten around to working on the post for the Io footprint paper. 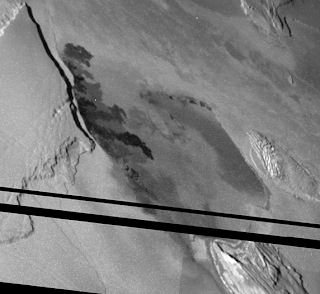 I had planned to get to it Monday, but unexpected work got in the way (new and interesting Titan images). The reason I had to get to it Monday was because starting Tuesday, I would have very little free time between working, eating, sleeping, and playing Grand Theft Auto IV, which hit stores the other day. Grand Theft Auto IV is a video game for the Xbox 360 and Playstation 3 consoles. The game follows a Eastern European immigrant, Nico Bellic, in a fictionalized version of New York City as he tries to escape his past and build a new future with the help of his cousin, Roman. The game, like its predecessors, has garnered attention for its graphic depiction of violence, however, it has garnered praise from nearly every reviewer for its epic plot (leading some to call it the "Godfather" of video games) and great gameplay. I bought the game during my local Gamestop's Midnight Madness Sale. Basically, the game was released on Tuesday, and to capitalize on the craving people have for playing this game, they open to store at midnight so people can be among the first to own a copy. The closest Gamestop to my apartment is only three blocks away in the best shopping center in Tucson (along with a Gamestop, it has a Best Buy, a Wal-Mart, a good shoe store, and a camping store). So I walked down to the store at a little before 10pm on Monday night, expecting to find maybe five people waiting in line to buy the game. Instead, I found 20 people already there. Waiting in line for two hours wasn't too bad. The employees knew how to treat their queue, giving out free chips, candy, soda, and water, setting up a TV outside to play some episodes of The Simpsons, and holding a raffle for random GTA IV-related merchandise, like posters, lanyards, and, wait for it, an empty box. I didn't win anything in the raffle, but I was pretty satisfied sitting in line with my chips, water, and iPod. By the time midnight rolled around, there had to have been at least 100 people in line, if not more, since I couldn't see the end because it stretched around the corner of the complex. I should note, to my surprise, that I did spot one woman in line for this game who WASN'T there with her boyfriend/husband/girlfriend. Not sure what that says about the audience for the game or the kinds of people who are stupid enough to wait in line to buy a video game at midnight on a weeknight. Finally, at 12:07am on Tuesday, I had my hands on the game I coveted for a few days now (okay, I preordered it several months ago...). I've played quite a lot of it over the last couple of days (almost 11 hours worth, so now you see why I have had no time to skim through a paper on aurorae). It is a very good game. Is it worth the perfect scores given to it by nearly every reviewer, I'm not sure about that. But it is definitely the best game I own and nearly the best I have ever played, but that's not to say that there aren't a few things that bother me about the game, or bugs in the game that I've noticed. I will try to post on any news item I see on Io or post about some new astrophotography, but I would not expect any major posts (beyond this one) from me this week.